Eric is 20 years professional strength coach and physical educator, strong First level 1 certified Russian kettlebell instructor, RKC Level 1 certified Russian kettlebell instructor, FMS movement screening and restoration certified, strength & conditioning coach for Evan Strong, Olympic gold medalist and professional snowboard racer, and 6 years S & C coach at Aikido’Ka, Grass Valley. Eric has trained in Soviet/Russian method powerlifting and is receiving regular instruction from international, physical educator and exercise historian Ron Jones. 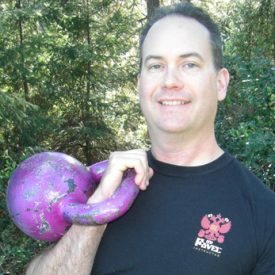 Eric has been training athletes and non-athletes, in the San Francisco Bay area, Gold Country and beyond since 1999. He draws on a lifetime of competing in a variety of sports from youth to college level, a very active stretch in the US Army, and full time study & practice of Soviet sports science since 2002. Eric’s style of instruction is very different from mainstream fitness training. Soviet/Russian methods focus on adept, natural movement, rather than working muscles or body parts in isolation. This makes for extremely strong, confident, well balanced and resilient athletes. These days Eric’s students range from retired seniors improving their golf game to professional and Olympic athletes. These local professionals also depend on Eric for top level conditioning: wildland & structural firefighters, Nevada County Sheriffs, professional aerialists, dancers & acrobats, and master instructors in Tai-chi, Aikido, Kun-tao, & Win-chun.